The distribution schedule is available on YieldShares.com. To receive a distribution, you must be a registered shareholder of the fund on the record date. 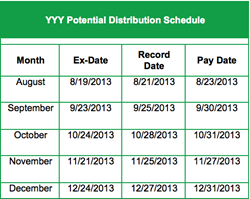 YieldShares has announced the 2013 Distribution Schedule for the YieldShares High Income ETF (NYSE Arca: YYY). The YieldShares High Income ETF (NYSE Arca: YYY) provides investors with cost-efficient access to 30 closed-end funds distinguished by their combination of yield, discount to net asset value and liquidity. The CEFs are selected by the ISE High Income™ Index and are diversified across asset classes, investment strategies and portfolio managers. 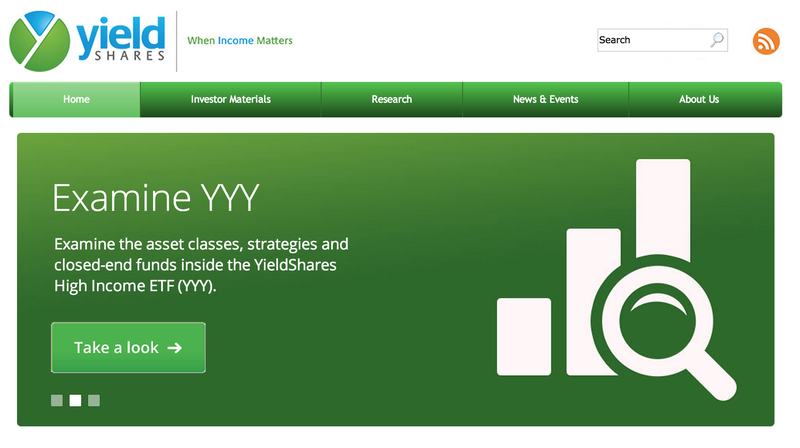 For more information about the YieldShares High Income ETF (YYY), please visit http://www.YieldShares.com. Carefully consider the Fund's investment objectives, risk factors, charges and expenses before investing. This and additional information can be found in the Fund's prospectus, which may be obtained by visiting http://www.yieldshares.com. Read the prospectus carefully before investing. Investing involves risk, including the possible loss of principal. Because the Fund is a fund of funds, its investment performance largely depends on the investment performance of the Underlying Funds in which it invests. An investment in the Fund is subject to the risks associated with the Underlying Funds that comprise the Index, including risks related to investments in derivatives, REITs, foreign securities and municipal securities. Fixed-income securities' prices generally fall as interest rates rise. High yield securities are subject to the increased risk of an issuer's inability to meet principal and interest payment obligations. These securities may be subject to greater price volatility due to such factors as specific corporate developments, interest rate sensitivity, negative perceptions of the non-investment grade securities markets, real or perceived adverse economic conditions, and lower liquidity. Preferred stock is subject to many of the risks associated with debt securities, including interest rate risk. In addition, preferred stock may not pay a dividend, an issuer may suspend payment of dividends on preferred stock at any time, and in certain situations an issuer may call or redeem its preferred stock or convert it to common stock. International investments may also involve risk from unfavorable fluctuations in currency values, differences in generally accepted accounting principles, and from economic or political instability. There is no guarantee that the fund will meet its investment objective. The Fund will pay indirectly a proportional share of the fees and expenses of the Underlying Funds in which it invests, including their investment advisory and administration fees, in addition to its own fees and expenses. In addition, at times, certain segments of the market represented by constituent Underlying Funds may be out of favor and underperform other segments. The underlying holdings of the fund may be leveraged, which will expose the holdings to higher volatility and may accelerate the impact of any losses. Exchange Traded Concepts, LLC serves as the investment advisor, and Index Management Solutions, LLC serves as a sub advisor to the fund. The Funds are distributed by SEI Investments Distribution Co., which is not affiliated with Exchange Traded Concepts, LLC or any of its affiliates.